2. That, combined with some serious busy-ness rather sent me into a state of no-tech. 3. My friend Jennifer brought over one of her old phones so I at least can check my voice mail and text. 4. It's a slippery phone and it keeps falling out of my hands. 5. Maybe that's why she had to replace 6 screens while she was using the phone. 6. So if you called me to wish me happy day, or tell me you adore me . . . well you'll just have to do it again. 7. As per usual for this time of year, I've been eating a lot of cake. 8. I made two cakes for Thanksgiving. 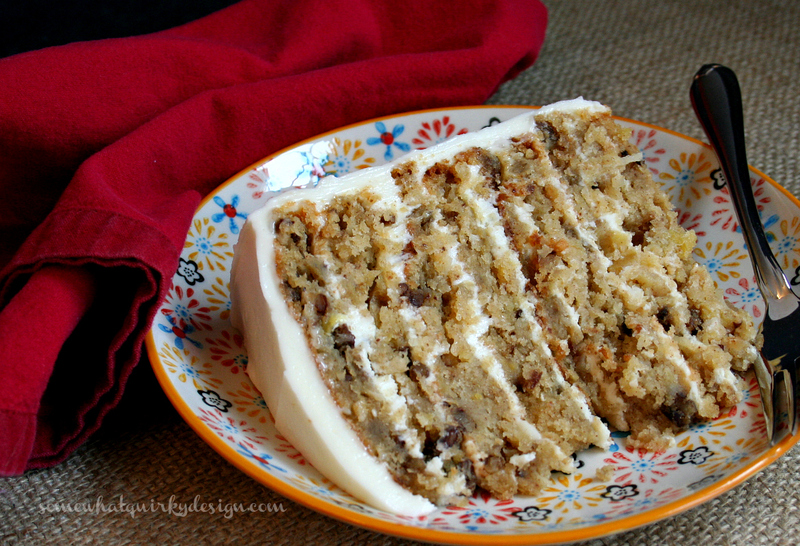 This White Chocolate Hummingbird Cake is one of them. The one I didn't take a picture of, well . . . it's the other. 9. I have decided that you should never try to split cakes with nuts in them in half. 10. Been wearing these slippers all day, every day a lot lately. 12. Yes those are wool carpet fibers all over my tights. 13. And yes, I have been crawling around on the floor. 14. I've been decorating for Christmas. 15. These tables are a microcosm of my whole house.
. . . totally clean and neat in one spot - and totally wrecked in the next. 16. 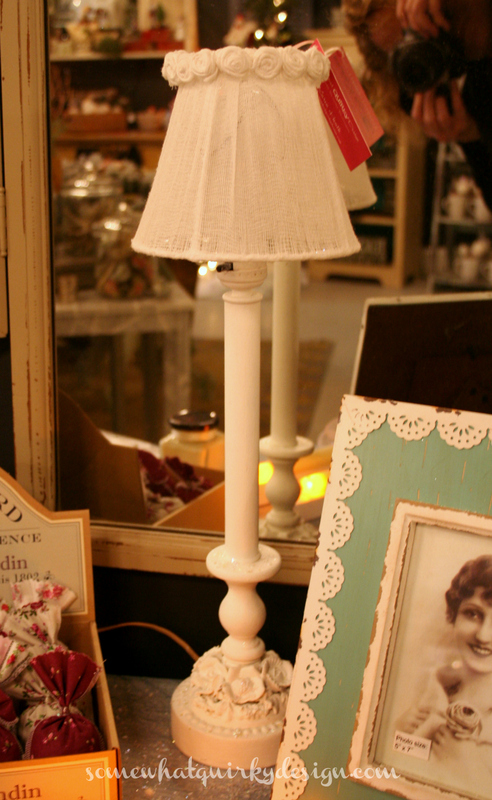 Been making these lamps and shades as well. 18. I sold some stuff. 19. I love selling stuff. 20. Money comes in handy. 21. I figured out what to do with my hand-me-down Christmas tree. 22. I yanked out one row of limbs and put them aside (but not away). 23. The cat found them and now he has 6 of the best cat toys a little cat could hope for. 24. Mr Quirky keeps gathering them all up and putting them on the table. 25. Sammy promptly climbs up on the table and knocks them to the floor, then begins to conquer them, one limb at a time. 26. I love The Voice. That Matt guy. He is magnificent. 27. Hope you had a nice Thanksgiving with lots of desserts! 28. Do you like The Voice? Do you like Thanksgiving dessert? Do you like cake? Do you like pie? Do you like cheesecake? Don't go away yet! Be sure to come back on December 4th! I'm going to be unveiling my Christmas Home Tour! Yes, that's right. 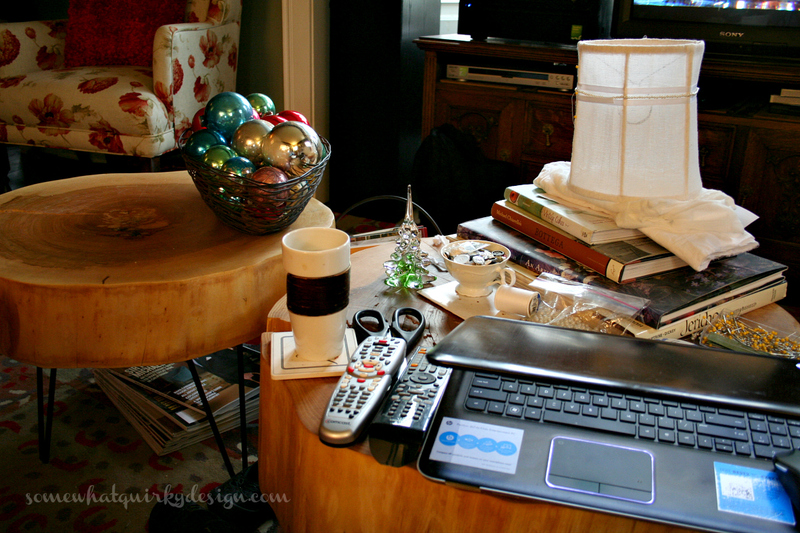 ME, the stick-in-the-mud blogger - I'm participating with a group of bloggers who are showing off their Christmas lovelies. My tour is on December 4, but the party has already started! Head over and check it out. There's a link where you can share your lovelies, too! 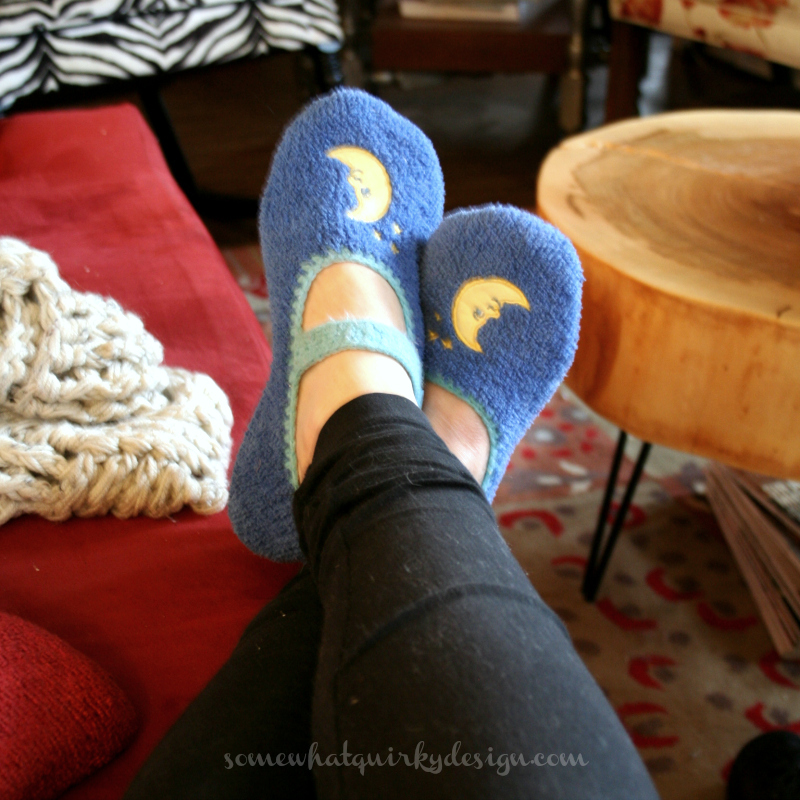 #10 I like your slippers - what kind are they? I wear old lady Dearforms - the kind with the toe cut out (but just enough, not so much that all the toes and half the foot slides out). My feet aren't allowed to sweat inside slippers - not cool. #28 Am I unAmerican if I don't watch the Voice? I love cake, pie, cheesecake and ANY kind of dessert! Happy Holidays! We're all crazy. Wool carpet fibers are so much more classy to have all over your clothing than my inevitable cat hair. That photo looked totally normal to me. Those lamps are adorable. Love the shades! Just came up with a cake I want to bake that has sour cream, cool whip & coconut in the frosting. Add some sparkly sugar and it will be perfect for the season. Karen every time I visit here I'm always amazed that people aren't commenting on your writing. Seriously, you are so damn clever and funny! I love this post--and found myself laughing out loud at different parts. Only a fellow BFF would show those slippers and point out the wool carpet fibers on your tights! enjoy your decorating my friend! I want a piece of that cake. But even more share how I make all those tiny layers! I love that but i am not sure how to get there. Yes, the nuts can make splitting them neatly rather challenging.